Ageing is becoming a significant global challenge which will require economic and social adjustments. Aging causes morphological changes in the brain associated with increased prevalence and incidence of neuropsychiatric diseases, mostly depression, Alzheimer’s Disease (AD) and Parkinson’s disease (PD). Neuropsychiatric diseases impair quality of life and pose a high economic burden to individuals and society. Thus, in order to better face these challenging diseases, it is of importance to understand factors that could contribute in their pathophysiology. It is now widely accepted that there is a strong genetic component in the development of neurodegenerative diseases, whereas emerging evidence is indicating also epigenetic mechanisms such as DNA methylation and histone acetylation as key players in the development of AD and PD. Also, women due to longer lifespans and unique risk factors, face the highest burden of these diseases, especially in menopausal years where major hormonal changes, such as a sharp decrease in estradiol, occur. To improve women’s neuropsychiatric health after menopause, estrogen receptorβ has been suggested as a novel target therapy for prevention and treatment of neuropsychiatric diseases. Further, alcohol misuse among elderly is on the rise and elderly women are particularly vulnerable to the adverse effects of alcohol, and alcohol use disorders in this subgroup are often overlooked or misdiagnosed. Also, elderly person has an increasing chance of a traumatic death of a loved one. An estimated 10-20% of bereaved people continue to grieve for a prolonged period. This complex condition is termed as Prolonged Grief Disorder (PGD), which can have a severe influence on the quality of life as it impairs daily functioning and sleep and may increase the risk of certain diseases. Our insight of the association between the dynamics of grieving process and overall health outcomes is still insufficient. The aim of the thesis was to identify factors associated with neuropsychiatric disorders among the elderly. 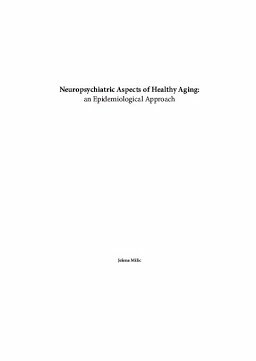 The first objective of the thesis was to identify epigenetic as well as women-specific factors that can play a role in the development of neuropsychiatric outcomes with emphasize on neurodegenerative diseases and alcoholism. A second objective was to identify the impact of grief and complicated grief on cortisol secretion, sleep pattern, and overall quality of life, as well as to identify factors associated with grief persistence. Sponsor The author received a grant to pursue her doctoral studies at the Erasmus MC from Erasmus Mundus – Western Balkans (ERAWEB), a joint mobility programme under the supervision of the Directorate- General for Education and Culture (DG EAC of the European Commission) and EuropeAid Development and Cooperation (DG DEVCO).